In life and in sports, sometimes you’re the pigeon and sometimes you’re the statue. Or, as one unwitting Notre Dame fan found out, sometimes there’s an eagle and sometimes you’re the landing pad. Notre Dame’s aerial attack produced precious little in the first half against Clemson. 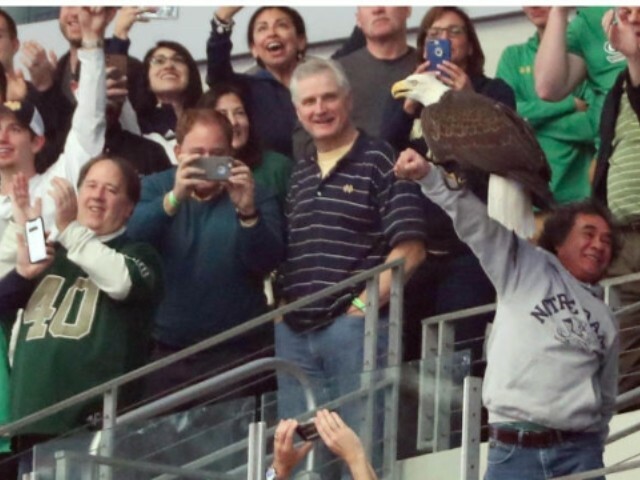 However, there was an impressive aerial connection made when a bald eagle that was part of the pregame show landed on an Irish fan. The incident also apparently launched Clark the eagle into the world of social media. According to WFAA, Clark had his own Twitter account by the start of the first quarter and was already asking who he should land on next? Who should I put my talons on next? In addition to landing, Clark could also clearly use some spelling work.